This year, Audi bumps the A4’s official horsepower rating to 220, and adds standard equipment in the form of Bluetooth connectivity, an Audi Music Interface, a programmable universal remote control, and a driver information display. New colors, new wheel designs, and a new Black Optic Package are also available for the 2014 Audi A4. 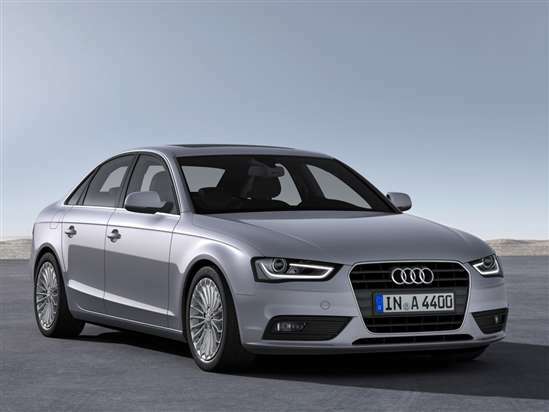 Audi offers the 2014 A4 in sedan format equipped with Premium, Premium Plus, or Prestige trim. Upgrading to Premium Plus trim adds triple-zone climate control, heated front seats, auto-dimming mirrors, and Audi Advanced Key passive entry with push-button starting. A sporty S-Line exterior treatment is also included for this model, along with Xenon headlights, LED running lights, and LED taillights. The A4 Prestige model is equipped with an Audi Multi-Media Interface (MMI) Navigation Plus system, Audi Connect services and mobile Wi-Fi capability, Bluetooth streaming audio capability, HD Radio, and a premium Bang & Olufsen audio system. This version of the car also gets adaptive headlights, a reversing camera, parking assist sensors, and Audi Side Assist blind-spot monitoring. A turbocharged 2.0-liter 4-cylinder engine is the only one offered for the Audi A4. It is rated to make 220 horsepower and 258 lb.-ft. of torque, the latter spread across a wide portion of the engine’s rev range. A continuously variable transmission (CVT) feeds the power to the car’s front wheels. Choose the optional Quattro all-wheel-drive system, and the car is offered with a 6-speed manual gearbox or an 8-speed automatic transmission. Depending on drivetrain selection, the 2014 Audi A4 is rated to return between 20 mpg in the city and 32 mpg on the highway, with Quattro models consuming more fuel in city driving than the front-wheel-drive models. The National Highway Traffic Safety Administration (NHTSA) gives the 2014 Audi A4 a 5-star overall crash-test rating. The Insurance Institute for Highway Safety (IIHS) had not rated the A4 as this overview was written, but in 2013, named the car a “Top Safety Pick.” Note, however, that last year’s A4 received a rating of “Poor” in the tough new small overlap frontal-impact crash test. Technology availability is dependent on the trim package selected, though all models are offered with rear-seat side-impact airbags and Quattro all-wheel drive. The A4 Premium can be upgraded with the Audi MMI Navigation Plus system, as well as LED running lights and LED taillights. Get Premium Plus trim, and the car is equipped with Audi Advanced Key. Options include a reversing camera, parking assist sensors, Audi Side Assist, and Audi Drive Select programming for the car’s driving dynamics. Audi Connect services are also available, turning the A4 into a mobile Wi-Fi hotspot. These features are standard for the A4 Prestige model, along with adaptive headlights and a Bang & Olufsen premium sound system with Bluetooth streaming audio and HD Radio. An Adaptive Cruise Control system and Dynamic Steering are exclusive options for the Prestige model.